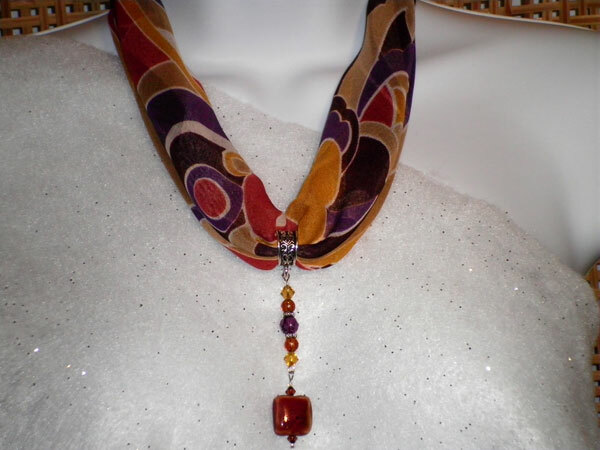 The scarf has many of the colors of autumn with rust, purple, brown, gold, white and ivory. The top of the dangle is a fully faceted purple round surrounded by brown rounds and gold glass bicones - all separated with silver spacers. The bottom is a beautiful ceramic square with varied colors - mainly rust. It has tiny brown bicones and silver seed beads on either side of it. I've included over 30" of sheer brown ribbon that can be used to hold the pendant if you want to wear the scarf and jewelry piece separately.